A little over a year ago, I cut my hair low to return natural. I.e for guys that don't understand that, I decided to stop the use of chemicals on my hair, and simply stick to my hair's natural state. Well, to return natural is like going back to basics, learning the new methods of caring for your hair and bla bla bla. 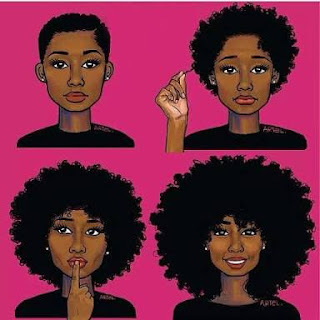 For a good while now my hair had been growing, but the growth stage wasnt too long, so I could wear my hair in an easy afro anyday. It's been over a year now, and the hair is grown, I mean grown past easy afro stage. Meaning to take my hair out with the intentions of looking normal, I need to take time and actually do something to it. This stage of growth is called the akward stage, whereby the hair isn't short, but isn't long enough to also do some things. Well it's my hair and while I contemplated cutting it low again because I knew how to manipulate my hair shorter, I decided against that. This, may be beause God had a lesson to teach me from that, or because I want long hair for my wedding. Anyway, in the past couple of weeks, I have been trying out different ways to manage my awkward hair length and now I can proudly say I am becoming an expert. I know someone might be wondering what has this got to do with Christianity and whatever, chill out for me, there is a lesson. As I have been learning to care for my hair, I have also been learning on spiritual growth. Just this evening the Holy Spirit called my attention to my hair learning or relearning process. He made me see how I had to make a conscious effort to know the best way to manage my hair (this included me making use of Google alot ) and how I have eventually mastered how well to manage it (well to an extent). He went further to explain to me how our life and journey as Christians is the same. We are, like the bible says to grow from being babes into maturity. But, while we so often crave for that growth (I really wanted my hair longer), we have to know and understand that a new level of growth, requires new knowledge, new action, new attention and new dedication. We cannot say we want to grow, and yet not work towards it. Even if we get to a stage where we know more, it requires action on our path to become bigger or accquire more. Jesus as seen from the book of Luke grew as a child and was noted to be strong in the spirit. For many years he kept growing and it wasn't until he went into the wilderness for some personal time with God, and overcame the temptation of the devil, did the bible record that he returned in the power of the spirit. Seriously , that is massive. Jesus knew he was the son of God, he knew he had a mission on earth. For many years he grew in the city and was noted for his growth, but until he made a step out of his comfort zone, until he made a step to greater glory, he didn't return with greater power. We, as people can't say we want growth, yet not be ready for growth. While I am relating this lesson in a biblical perspective, the knowledge applies in every facet of our lives. To grow, you need to work at it. This can be seen in us saying "Lord I want a relationship", " Lord I want to get married", but the truth of the matter is, are you ready to take the step to be there. Are you preparing for that stage, are you learning the things required, or are you simply wishing and hoping and when you get where you say you wanted, like me contemplate returning to your old stage. The bible says his grace is sufficient in our weakness. This implies, that if we get to a stage and think we don't have the strength to be there, stay there and grow there, all we have to do is call on him to help. He also says we have the Holy Spirit always available to teach us. This means we actually have all the resources available, all we need do is utilize them. We have a role to play too and that role will determine our success. God bless you for this message. .such a good read. Great post,very insightful. Thanks for sharing. Hmm.. I did not intend to get an in depth kmowledge as this...powerful! Hmm.. I did not intend to get an in depth knowledge as this, per the subject ...powerful!